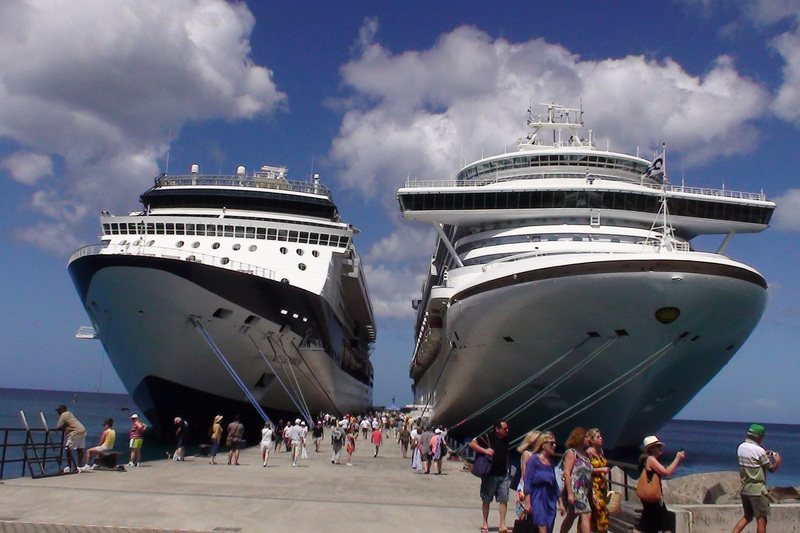 Cruise industry advertising: Smoke & mirrors? Perhaps it’s time the ultra-luxury cruise lines started rolling out the red carpet before booking. Only occasionally do we find ourselves in the position of feeling a travel rant coming on. This week is one of those weeks. For many years we’ve been dividing our travel time among various adventures: resorts, road trips, private touring, and often cruising. Since we’ve both been very busy in in our work lives, when we are choosing a cruise we have to book far in advance at whatever price is on offer for the itinerary and suite that we know will make us happy. Notwithstanding the exorbitant prices that we’ve often found ourselves paying over the years, we have been completely happy with our choices after the fact. Unlike many people we know who search for bargains, we have never returned home complaining about accommodation, service or overall experience. You get what you pay for, we’ve often opined. So why are we complaining now? We have moved into a phase of our lives when we don’t need to plan so far in advance. This means that we’d like to be able to take advantage of at least a few of the copious numbers of offers that find their way into our real and virtual mailboxes every week. God love the cruise industry: if it weren’t for them, we’d hardly have any real mail! We have often wondered if the cruise lines really think that we’re dumb enough to believe that what we are paying are two-for-one prices. For example, every single piece of material that comes to us from our favorite lines (ultra-luxury Silversea, Seabourn, Regent and recently Oceania) tells us that we will be paying essentially half fare. The fare is always listed in two columns: “brochure fares” and “savings fares.” Brochure fares are always (at least) double the savings fares. Indeed, they never seem to be charging brochure fares at all which leads us to believe that they don’t have to adhere to the usual advertising laws that force retailers to actually offer the merchandise at the full price for a minimum period of time before they can advertise it as being on sale. And, just who in their right mind would pay some of those fares anyway? Two recent examples: Just over month ago, we tied to book a Regent cruise from Athens to Turkey for the fall on the day we received in the mail a brochure indicating special past-guest savings for the itinerary we wanted. We immediately emailed our travel agent who, within minutes went to work on the booking. When she contacted Regent to book it, the offer was not being made available to us. Sorry, they said, they should have booked earlier. We had the brochure right in front of us. According to our travel agent, Regent told her that the offer had changed and referred her to the asterisk that indicated subject to change without notice. We could only conclude that that would kick in about one minute before a past-guest actually called to book. We even attached a screen shot of the newly-arrived brochure to a return email to our travel agent. Regent would not budge. We are now booked for almost the same itinerary on a different cruise line and are feeling very sour about Regent on which we have sailed three times before. So much for perks of being a past guest. The second example was just this past week and was what set us off on the rant. We received another tempting offer last Friday and contemplated taking advantage of this advertised fare in a Seabourn brochure. We were considering booking a veranda suite aboard the Quest for 35 days in South America this coming winter. We were delighted to see that this category of suite was on a promotion: a savings fare from $10,999 down from a brochure fare from $36,500. Let’s ignore for a moment that we wouldn’t even look at such a fare for this small suite even on a Seabourn ship (and the fact that they never really offer it at that fare because no one would pay it) and concentrate on the asterisk that followed the word from. Yes, of course we see the asterisk and expect that if we are not planning to sail on the asterisked date (October 25) we will pay more for February 24. However, given that this is being promoted as a great saving, we expect a reasonable sum more. We would be wrong. When our travel agent tried to book this for us, she found that indeed the price we would have to pay would be $14,999 per person not including taxes which would bring it up over $16,000 per person. We called Seabourn to inquire ourselves with the brochure in front of us. They simply reiterated what she told us and pointed to the asterisk. This is a difference of over 25% and is unacceptable as a hidden piece of information. The cruise line may believe that the asterisk protects them from liability for false advertising, but as a customer (and past guest of this cruise line) we think it is disingenuous and this kind of advertising needs to stop. “Your ads should clearly and conspicuously disclose all the information about an offer that is likely to affect a consumer’s purchasing decision. Disclose the most important information – like the terms affecting the basic cost of the offer – near the advertised price. “…(b) Advertisements must not omit relevant information in a manner that, in the result, is deceptive. (c) All pertinent details of an advertised offer must be clearly and understandably stated. As far as we are concerned, these advertisements are misleading doing more than putting pertinent information in “obscure locations” and contain “disclaimers and asterisked footnoted information” that contradicts the main message. The cruise line may believe that the asterisk provides legal protection (which is arguable), but it certainly doesn’t provide them with moral protection. Shame on them. Our bottom line is that we are a bit sour on Seabourn now and will reconsider our winter cruise plans. On more than one occasion in the past we have referred to ourselves as (if you will pardon the expression) “cruise whores.” In other words, we are not monogamous – we cruise around so to speak. Despite the fact that we have never taken a cruise that we didn’t enjoy, we have been making our way around the industry (avoiding several specific lines because of personal experience and research). We might even describe our behavior as moving up the cruise food chain so to speak. Here’s our story. We like to travel. We like to travel by plane, train (well, not train so much after that overnight “hotel train” between Paris and Barcelona a few years ago), limo, car, foot etc. We just like to experience new places. We sometimes stay in one place for a while; sometimes we stay only a day and move on, either by car or by ship. Despite the snotty travelers who are disdainful of the ‘travel’ value of a cruise, we do enjoy them. They are our way to sample many different places in the world, some of which we have returned to for longer visits. The point is that cruise travel is just one more way for us to see the world. We no longer book cruises just for that week in the sun in the middle of the winter. We’re not knocking that, but for us cruising has taken on another whole dimension. Our first cruise plans began much like any other family’s vacation plans. We had a young child, we wanted to escape the winter briefly, and we had only a week or two of winter vacation. So, we contacted our trusty travel agent (if you want to know why we use a travel agent, you might want to read Why you need a travel agent…really) who chose Carnival cruises for that first trip. And so we booked a verandah cabin and made our way to Miami. Needless to say we had a wonderful time. This was in spite of the multitude of drunken spring-breakers who spent the entire cruise camped out on the deck, never once even making it into the dining room. The dining was therefore blissful! The kids’ club was a real treat for our young son, and we were introduced to a number of Caribbean islands that we had not at that time visited. We’ve been back many times since, but we have never returned to Carnival. Why have we not returned to Carnival? You might ask. The reason is the same one that keeps us off NCL and Royal Caribbean: not our kind of experience. The glitzy décor, the loud passengers, the too-happy cruise directors, the big, showy performances nightly (OK unless you’ve seen a London West End show or been to Broadway in New York) – well, let’s just say that we’ve evolved. So it was on to Holland America. We sailed on Holland America three times, including our wonderful Christmas Cruise. We started out in what was then referred to as a Superior Verandah suite (now called the Signature Suite) for the size enhancement, but that began our upward move toward larger and larger suites. The next two cruises on HAL were in Deluxe Verandah suites (now called the Neptune Suite) and we would actually return to this line for the right itinerary. 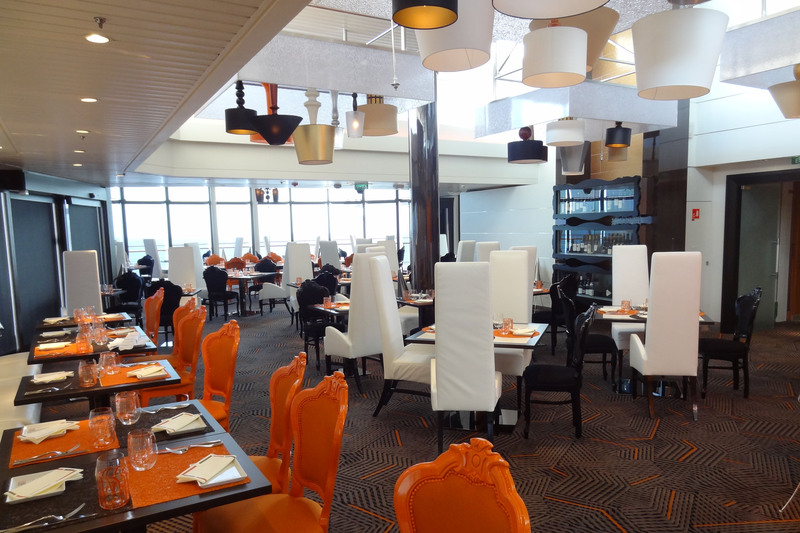 The exquisite Qsine on the Celebrity Summit. We spent our twentieth wedding anniversary on the Celebrity Century in the Mediterranean. Splurging on a Royal suite, we didn’t realize that we were setting ourselves up for a few expensive vacations. After this kind of accommodation – and being in the Med – how could we ever return to a ‘normal’ cruise in the Caribbean in a regular stateroom? Well, we couldn’t. 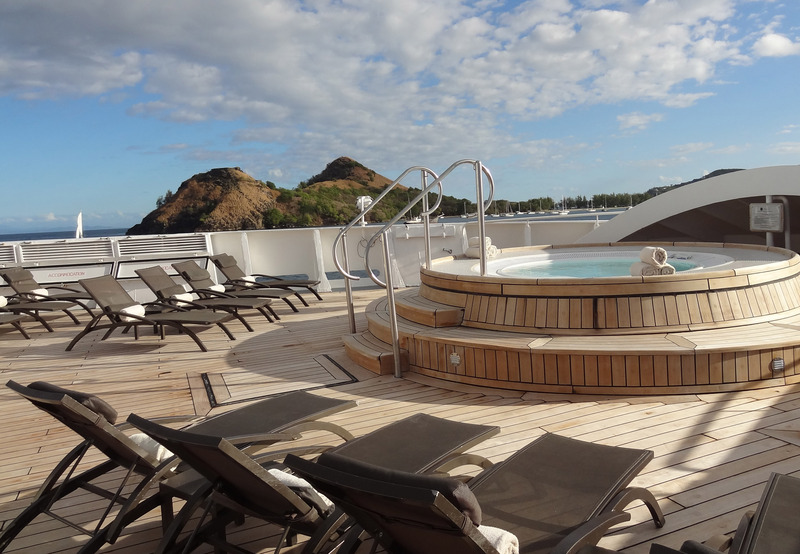 Our return to Celebrity was a couple of winters ago when we wanted to sail out of Puerto Rico; unfortunately, the experience didn’t meet our expectations despite the Jacuzzi on our large, private verandah on the Millennium(although we did enjoy ourselves as always). Cruise lines always say they want to “exceed your expectations.” The problem with that is when your expectations, like ours evidently tend to be, are very high, it’s difficult if not impossible for the line to accomplish this. If a line can meet our expectations, we’re delighted. Exceed? Well maybe this upcoming one will (more about that later). Our desire to move up in terms of luxury cruising (despite their “modern luxury” advertising tag line, Celebrity does not fall into this category: they would be considered premium) led us to Regent. We embarked on our first Regent cruise on the Navigator in a Navigator Suite (448 square feet) in Fort Lauderdale to set sail for a Western Caribbean cruise including Mexico, Guatemala and Belize, places we wanted to visit – or revisit in the case of Mexico. Regent was our first so-called real luxury cruise experience, and the first one that is all-inclusive. This is a wonderful addition since you never have to take out your key card to sign for your drinks, and your suite is equipped with a well-stocked, included bar. If you don’t want to socialize, you simply pour yourself a drink and repair to your private verandah. Overall, the cruise was wonderful. The Navigator was, up until that point in our lives, the smallest ship we’d ever been on: 490 passengers. We loved that part of the experience, but were unaware that Regent cruises from Florida carried a much higher number of older passengers. To be clear: we were in our fifties-sixties and were among the youngest dozen passengers on the ship! One evening we took a foray into the piano lounge to find it resembling the day room in a high-priced senior’s home! Art on board the Regent Seven Seas Mariner in Montenegro. It was a great trip, but not a ship we want to revisit this winter in the Caribbean. 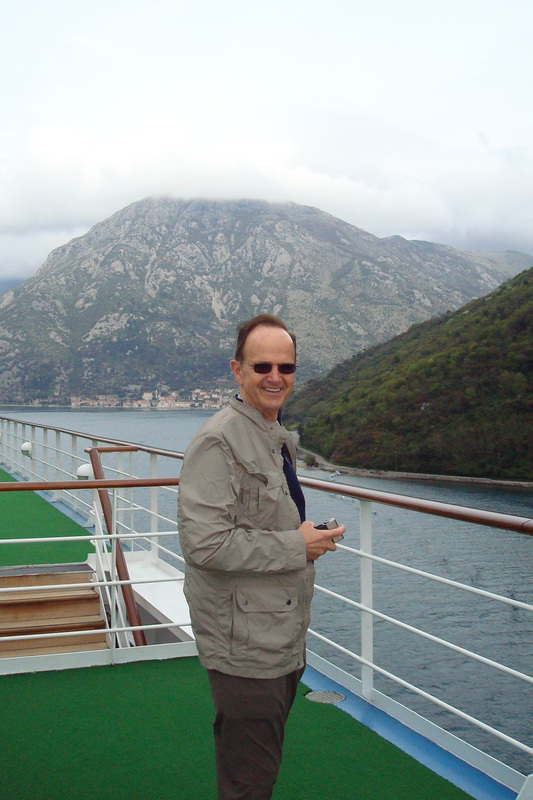 Our next Regent experience was on the larger Mariner leaving from Monte Carlo onward to Venice. Our Penthouse suite was a bit smaller than the Navigator suite, but with its floor to ceiling windows we could sit inside when the weather in the Adriatic was cool and watch the shoreline as we cruised the fjords of Montenegro. We will probably return to Regent someday. After six days at the Crane Resort in Barbados, we boarded the Silver Cloud in Bridgetown for a cruise to Fort Lauderdale. With a capacity of only 296 passengers, we were moving down again, even as we were moving up. And moving up we were. The oldest ship in Silversea’s fleet, the Silver Cloud was nonetheless extraordinary. But more important than that, the service was impeccable. We truly thought we had died and gone to heaven. Little did we know that we were only part-way to heaven. Everyone should do it once. Of course we’re talking about a true transatlantic voyage on a real ocean liner – not a cruise ship. Three years ago we boarded the Queen Mary 2 in Southampton and spent seven wonderful days at sea making our way across the North Atlantic to New York. 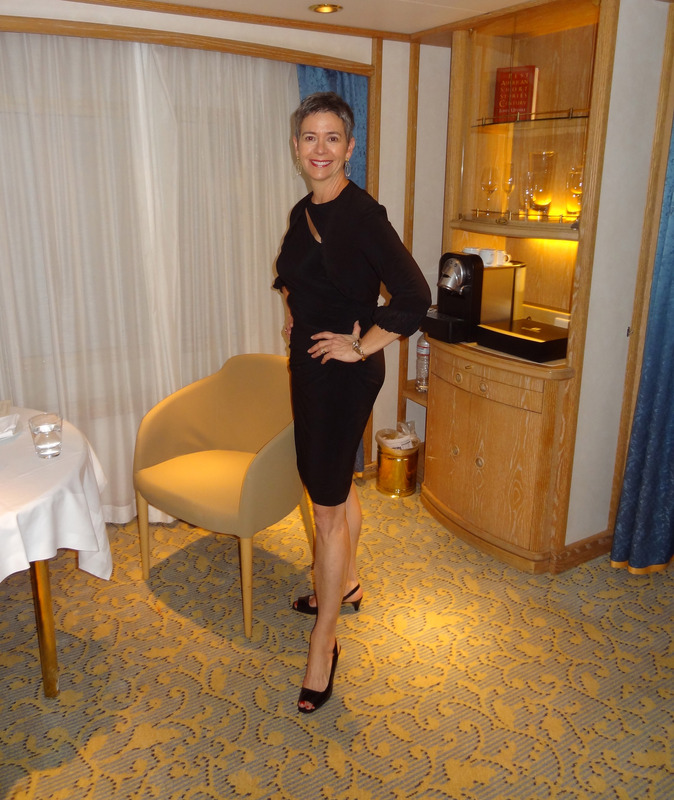 What truly made this a step up even from Silversea was that we booked into a Queen’s Grill suite and found ourselves in a ship within a ship. Make no mistake: Cunard has three classes and Queen’s Grill is first class all the way. With its private dining room and bar, the Queen’s Grill provides passengers with the best of both worlds: the intimacy of small ship service and the amenities and entertainment of a large ship. 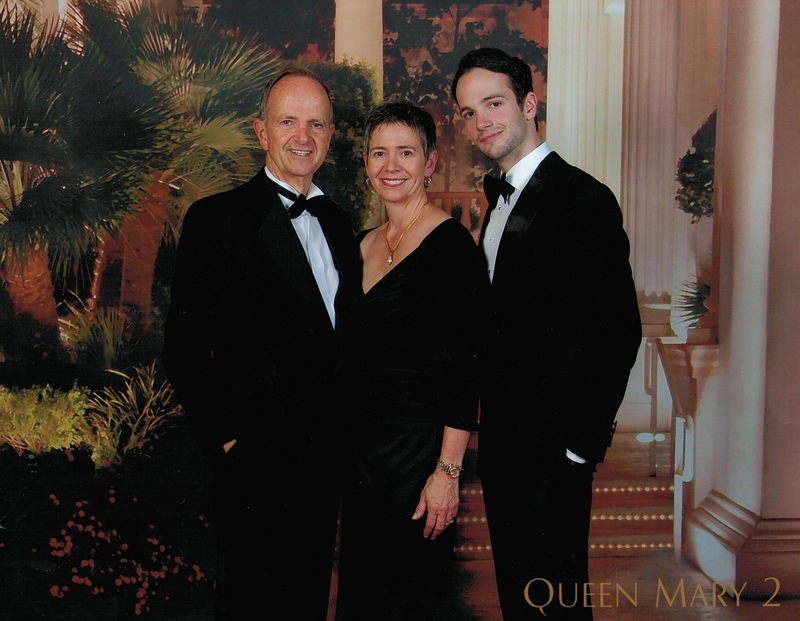 A family portrait aboard Cunard’s Queen Mary 2 last summer. It’s the only way for the three of us to get a professional portrait since we live on a different continent than our son. A great opportunity when we’re all dressed up. Although we would not do a transatlantic voyage again, we will certainly return to Cunard for the right itinerary (there it is again: itinerary). The pinnacle of luxury perhaps? 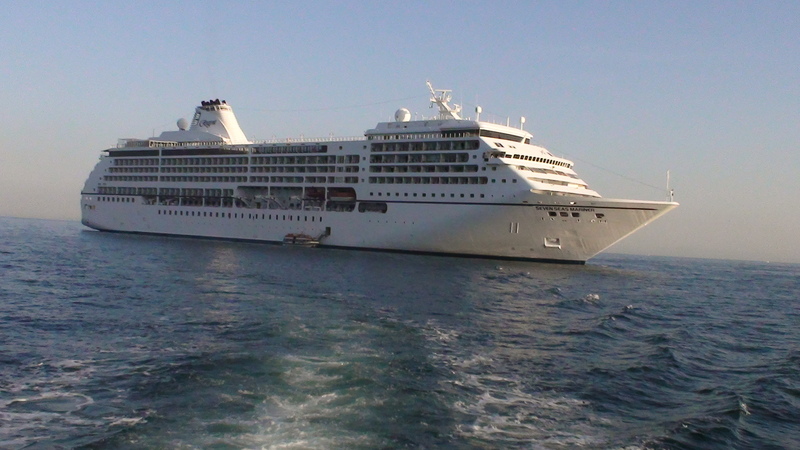 Last year we booked passage on a 204 passenger luxury cruise ship: the Seabourn Spirit. After almost a week at the luxurious property The House in Barbados, once again we sailed from Bridgetown. This time, however, it was to ports and islands where large ships can never go. 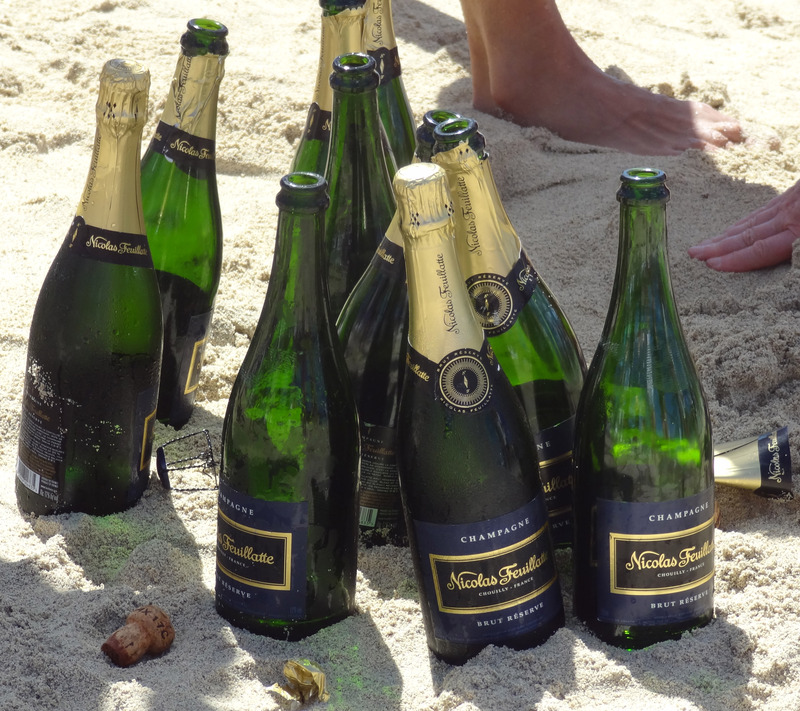 Everything about the Seabourn experience (caviar and champagne on the beach, anyone?) was above and beyond. The service was superb, as was the food and the accommodation. It truly was like a country club and we savored every minute of this super-luxury experience followed by six days in St. Martin. How could we possibly top that? We aren’t sure we can top that last experience, but we’re going to try. Art is retiring from his private family medicine practice in a few weeks and we’re off to that ultimate, post-retirement reward. After five days in Tahiti, we’ll board the Oceania Marina for almost three weeks meandering through French Polynesia, Samoa and the east coast of Australia, ending with five days in Sydney. Why Oceania? Last winter while in St. Martin following the Seabourn experience, we dined one evening with fellow passengers from the Spirit. They asked us if we’d ever sailed on Oceania. We had not. Given that they had just disembarked from a Seabourn cruise which they enjoyed, we had to take seriously their recommendation that we give Oceania a try. But what we were really looking for was an itinerary that would take us to new places. We hit on Oceania’s South Pacific cruise and the rest is history. Stay with us for a while and come along on that special vacation as we try live blogging and tweeting for the first time. Champagne in the surf? Even better with a bit of caviar! The promotional DVD was impressive: a group of white-uniformed ship’s employees standing waist-deep in sparkling water just off a beach on some unnamed tropical paradise. Smiling, they offered caviar and champagne flutes to the beautiful people. What kind of gimmick is that, we wondered? But, when we booked our Seabourn cruise of Caribbean yacht harbors, we were determined that we’d find out. And we did. The day began as we anchored off Prickly Pear Island in the British Virgin Islands. It was a spectacular day with calm seas and brilliant sunshine. We are not usually the type of travelers who like to spend entire days on a beach, reading, sunning and drinking. In fact, our plan for that day had been to stay on board the ship until near noon, then to take the tender ashore just in time for the caviar ‘thing’ and the beach barbeque. The thought of a beach barbeque and eating a hamburger in the sand wasn’t very enticing, but we thought we’d like to experience the event for ourselves. Oh how wrong our preconceived ideas can be! We made our way into the lounge where passengers awaited the tenders, just to see how things were going. It was about 10:30 am and according to the crew members there, the preparations had all been made, crew had taken over to the island all of the trappings needed for the day, and we were free to go ashore. Never wishing to wait in crowded lounges for anything, we looked around, saw nobody and quickly scooted back to our suite to change into bathing suits and gather beach accoutrements. Within minutes we were aboard the tender making our way toward the beach. 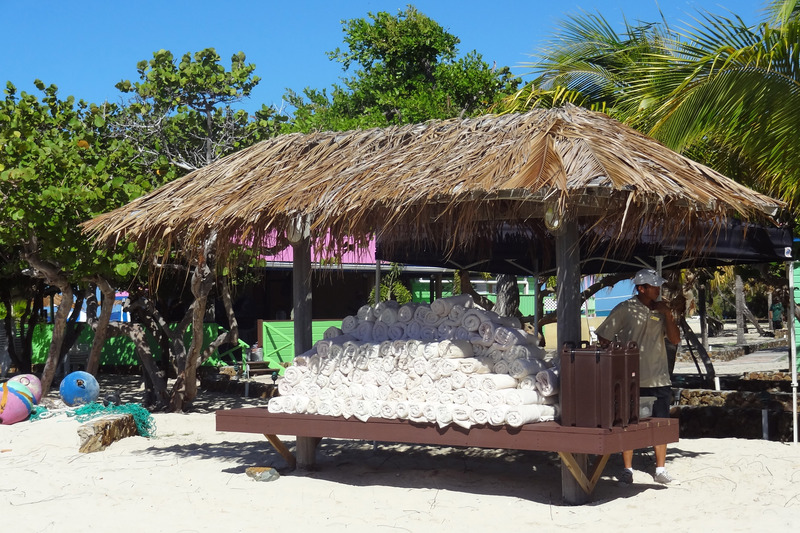 As we arrived on the pier, we could see the grass hut where several hundred fluffy white towels had been individually rolled and stacked earlier by crew for the arriving guests. A young crew member approached us and offered water or fruit punch. We noticed that there were only a very few people who had evidently made it on to the first guest tender ashore before us – and this, despite the fact we thought the place would be mobbed. Silly us! With only 200 passengers on board in total, mobs were simply out of the question. And it must be noted that this is a deserted island, save for the beach bar and grill that was commandeered by Seabourn for the day. There was no one else there. We made ourselves comfortable on lounge chairs mere feet from the lapping waves, and settled the umbrella so that we could have some shade. Then the beach service began. Barefoot bar servers from the ship, today in casual uniforms, delightedly served frozen drinks – any kind you want, as many as you want. After sipping a frozen margarita, we explored the beach and discovered something wonderful. 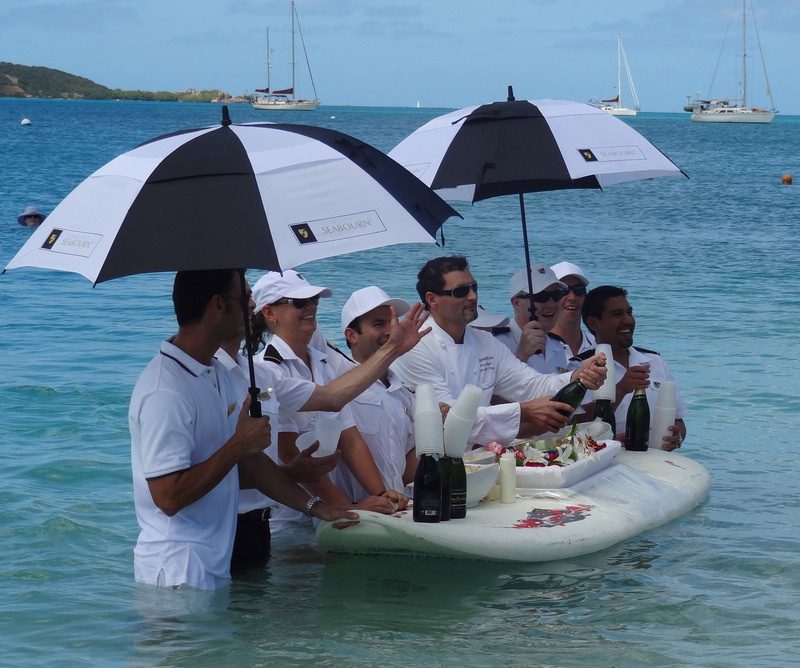 The captain and crew of the Seabourn Spirit bringing champagne and caviar from the ship. There were to be not hamburgers eaten in lounge chairs. No, Seabourn had something completely different in mind for its discerning travelers. They had brought china, silverware, table cloths from the ship and had set up an open-air dining facility. And on the menu was a vast array of barbequed pork, shrimp, and beef…too much food to even imagine. Then there were the sides, salads, desserts – all brought from the ship that morning by hard-working crew members. Late in the morning, the water sports activities were live. We spent some time enjoying the island from the water in a paddle boat and later Art water-skied. All of these activities enjoyed while under the watchful eye of the two crew members aboard the fast rescue craft that floated unobtrusively offshore the whole day. At around noon, the chef from the ship, accompanied by several of his bar staff took up striped sun umbrellas and waded into the water. Shortly after, a rubber dinghy, driven by the ship’s captain (!) left the ship making its way toward the beach – they were bringing the caviar and champagne. And so, we were served caviar by the chef himself while the bar staff happily opened bottle after bottle of wonderful champagne that the guests delightedly imbibed as they waded out of the water to the clicking of a hundred camera shutters. What impressed us most is that the crew members all seemed to be having as much fun as the guests – they never gave the slightest hint that they felt it was work. Chef opens the first bottle of champagne. After this impressive hors d’oeuvre we took up plates and made our way through the buffet. We had a wonderful lunch, not hunched over on a beach chair as feared; rather we ate at a white linen-topped table in the shade with a friendly American couple from the New York area, while sipping on a glass of chilled sauvignon blanc. We were among the last guests to leave the island that day! So, was the promotional DVD honest? Absolutely – except for the champagne flutes. No glass was actually permitted – you’ll have to watch our video to see…or you can just book a Seabourn Caribbean cruise and see for yourself! Happy cruising! 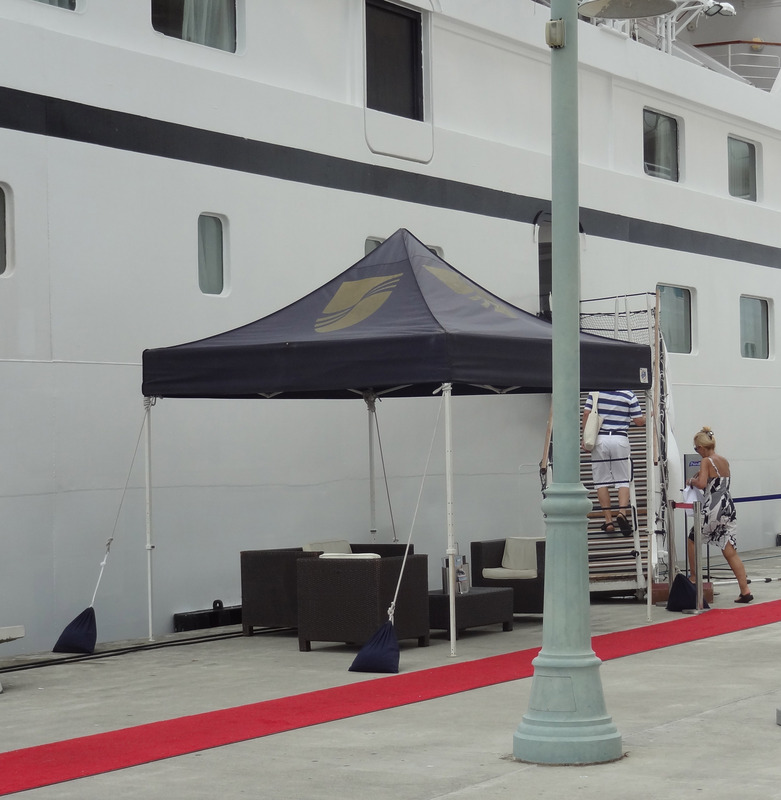 Seabourn lays out the red carpet on the pier for its guests. On a six-star, so-called luxury cruise a few years ago, we were in the bar one evening, everyone dressed to the nines, sipping cocktails and getting to know one another. We asked a selection of our new friends who hailed from various parts of the world, what the term luxury meant to them. Most of them said that they had never really thought about it. Indeed, these were people who, by all external standards, might be considered to live a luxurious life as a result of their income and standard of living. They were, however, not among the idle rich. All were successful in their chosen fields: medicine, law, business (the latter of which seem to have the most money of all). When they were finally able to answer the question, they didn’t suggest jewelry, designer duds and handbags, or even private jets (although, admittedly, the private jet experience might be a luxury we might enjoy – but only if the service was terrific – which is at the heart of this story). Luxury to them included things like “having someone to wash my hair every day for me,” and “fresh sheets on my bed every single day.” Not quite what you might have imagined. But luxury means different things to different people, and for these discerning travelers, service is at the heart of the luxurious experience. Our recent cruise on the Yachts of Seabourn (on the Seabourn Spirit) was, then, one of the most luxurious experiences we’ve ever had. Bar none. After five wonderful days at The House in Barbados (the subject of our last post), we thought that the service they gave could not be topped. We were wrong. Arriving at the cruise terminal in Bridgetown, Barbados, we were greeted by a Seabourn representative who had our luggage whisked away, and directed us to the private transport. We mention this only because two years ago when we cruised from Bridgetown on Seabourn’s competitor in the luxury cruise business, Silversea, they put us on buses with hot, dirty and damp revelers from several other mega-ships who all looked at us as if we had three heads, and gave us the stink eye for taking up space with our hand luggage. Not this time, though. 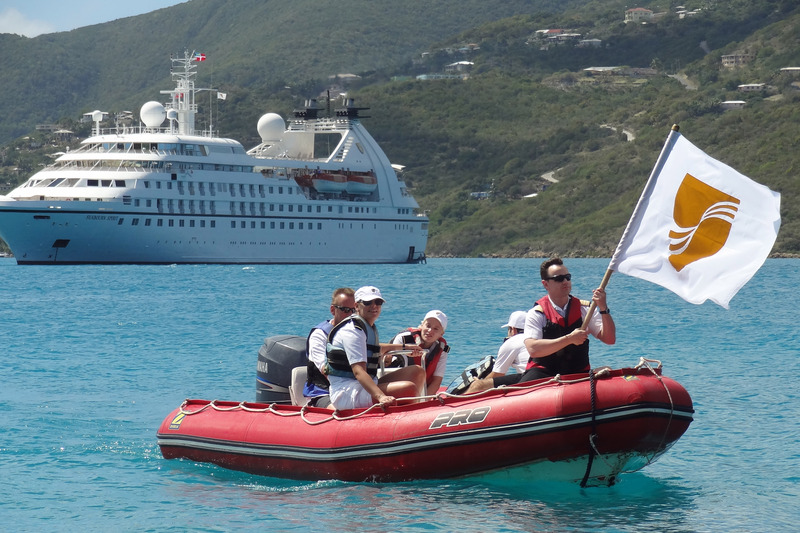 The transport was just for Seabourn’s embarking guests. If you’ve ever been on a mainstream cruise, especially one that leaves from Miami or Fort Lauderdale, then you’re familiar with the cavernous cruise terminals where the lineups are legion. Even if you’re in a suite and have a dedicated, priority boarding line, the crowds are daunting and the service brisk if friendly. This is where the luxury cruise lines have all of those others beat: personalized service where you feel important right from the start. Once on board, we were ushered into a lounge where embarking passengers were sipping champagne and registering. Before long we had had our photos taken, our credit card registered and were on our way to our suite. Patty poses in our suite one evening. We have been in many lovely suites in our lives, and this one was attractive – not outstanding, but delightful nonetheless. Our suite stewardess arrived in due course to provide us with another glass of champagne (to add to the bottle chilling in a silver ice bucket on the dining table in the suite) and offer us a selection of high-end soaps (Hermes, Salvatore Ferragamo, Molton Brown). All of this is very nice, but if the service isn’t terrific, then the experience is not luxurious. We were not to be disappointed! After unpacking our suitcases which arrived in record time and settling everything nicely into the very spacious suite with oodles of storage space, we attended the life boat drill, explored the admittedly small ship and eventually made our way to the dining room for dinner. As we approached the Maître d’ he greeted us by name and asked us for our table preference, since we can eat whenever we want with whomever we want – even just ourselves. This ability to identify the guests by sight on first meeting is impressive – no doubt they have access to all of our photos! The food was really wonderful, but the service was even better. Every day we were on board, we ate at least two meals in the dining room and were impressed with the service from everyone from the bus boys through the servers to the sommelier who was particularly service-oriented. 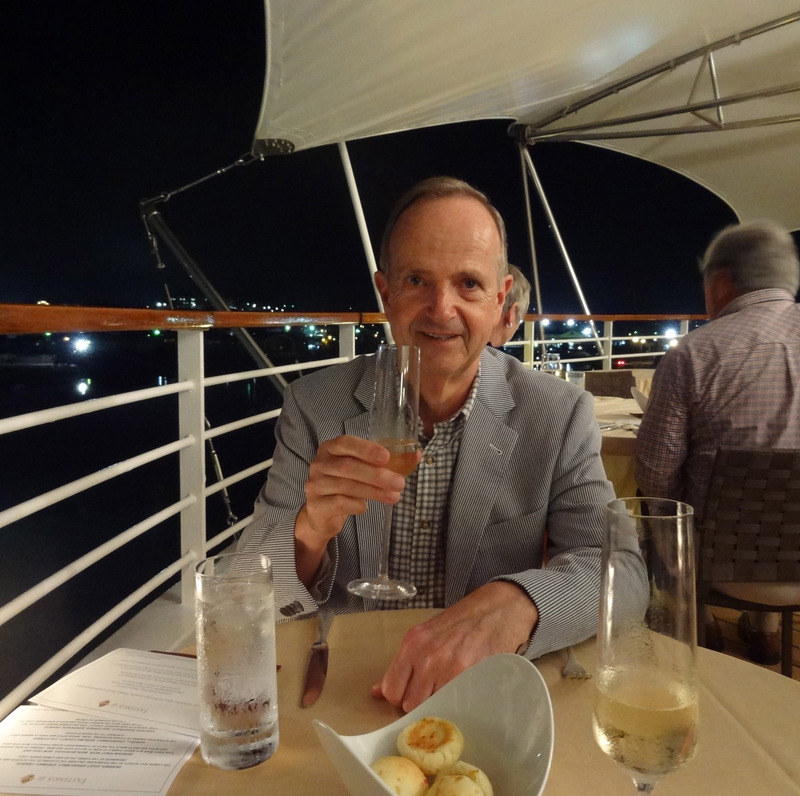 Art enjoys the impeccable service at Restaurant II while docked in Antigua one evening. Bar service (any drink you desire, sir), deck service (would you like a drink, sorbet in the afternoon, a cool towel? ), spa service (how can we help? ), front desk service (is there anything you’d like fixed in your suite? Yes? Done!). All in all, a vacation to remember – and a luxurious experience to repeat – which we certainly will. Seabourn, you’ve beaten Silversea and Regent. And we haven’t even told you yet about caviar (and champagne) in the surf – but we will! Come along with us and tour our suite: Owner’s Suite #5 on the Spirit.